Yesterday evening, I attended my first ever Topshop event! I was beyond excited - it's still to this day my number one high street store, and I'm always in awe of their pieces every season. The event was held on the top floor of the St. Stephen's Green branch, in their swanky personal shopping suite. The personal shopping service is completely free (amaze), and Una is the personal shopper in residence for this branch. The suite is bright and spacious with flattering lighting, comfy couches and fashion magazines to flick through. You can book the service for just yourself, or for a group of you and your friends for a Topshop shopping party! I was given a look at the new Autumn/ Winter collections, and I fell in love with everything (as I always do with Topshop). There are 4 main collections; Scandi Girl, The Sensationalist, Pennsylvania Military and Factory Girl. 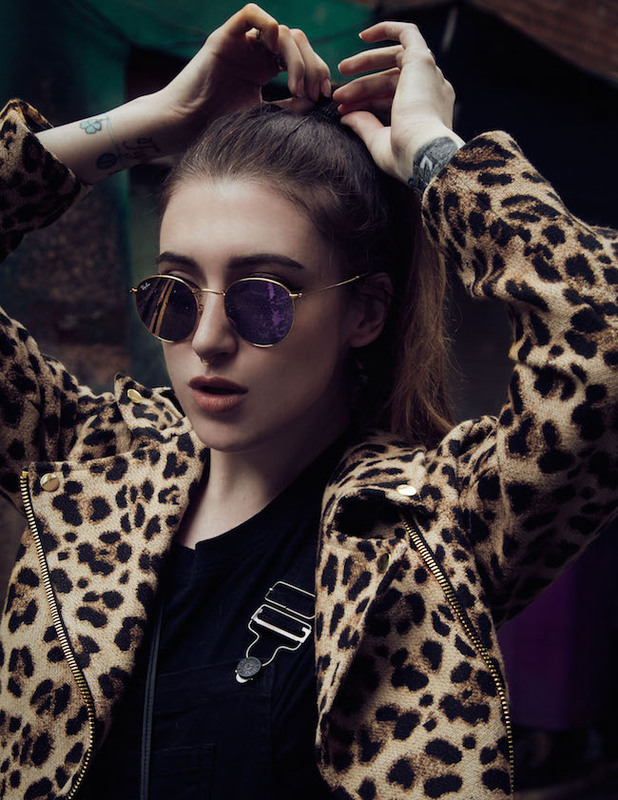 All completely different from each other, but bang on trend and unique with the classic Topshop edge added to the mix. My personal favourite collection was The Sensationalist, with everything from leather, to studs and spikes! All of the stock pictured below is available to be in store or online now. Factory Girl - so Edie Sedgwick! Chloé Susanne-alike boots, for only a fraction of the price? Need! I fell in love with this Topshop Premium suede fringed jacket. It's quite an investment buy at €265, but I think it'd look AMAZING to wear at London Fashion Week next month. I currently have it on hold, and I'm deliberating on whether or not to purchase it. What do you guys think? I adore it, but I'm a bit iffy on the print. I'd prefer if it was all black, as I think I'd get more wear out of it. 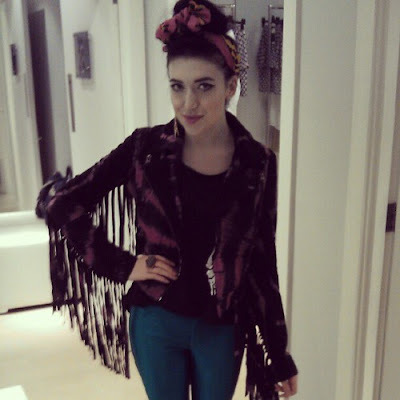 The fringing is to die for - it's such a statement piece. Hmm.. 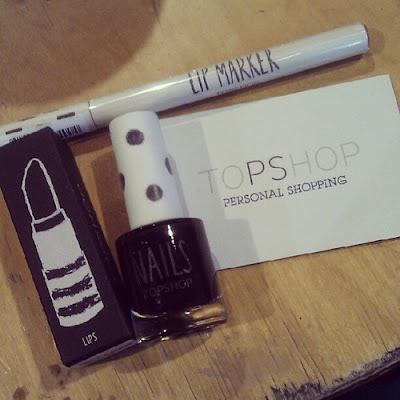 I received some gorgeous Topshop makeup goodies in my giftbag! I haven't used any of the Topshop makeup line yet, so I'm sooo excited to try these bits out. I received a Lip Marker in 'Orange', a Nail Polish in 'Ruthless' and a Lipstick in 'Desert'. I'll definitely be reviewing these in the near future, so keep an eye out! 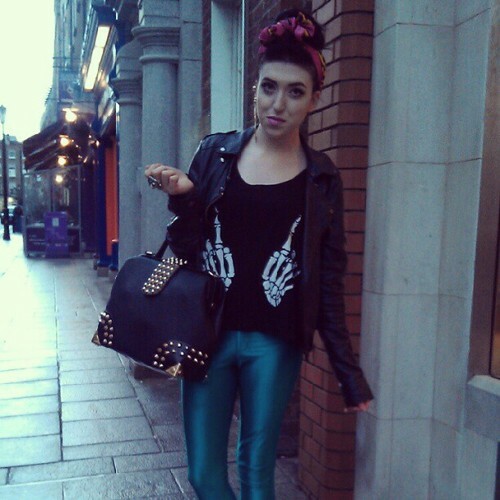 What I wore: Versace for H&M scarf (in hair), ROMWE skeleton hands t-shirt, American Apparel Disco Pants in the shade 'Deep Peacock', a Topshop leather jacket and my beloved Oasap studded bag.